Good News For BSNL users: BSNL has increased the minimum speed post FUP to 1 Mbps. Hence, you can get 1 Mbps plan at Rs 545 (approx) throughout the Nation. If you are one of those customers; who are dismayed and feel pathetic by Ortel’s broadband services, then I was and still sometimes am one of you people. Do know Ortel’s broadband services could be great sometimes, for some people, the service is flawless, hard to believe it right? Well, some people does get decent signal and speed. People have reported that for them, Ortel is the best broadband service provider in their area. Though there are other options like BSNL broadband, however, they have already chosen Ortel. So if you are stuck with Ortel pathetic service, I can provide you few tips that could help you to get right or decent speeds from your Ortel Broadband service. Note: I’m currently using 1 Mbps plan and also have tested plans like 512 Kbps, 786 Kbps, and other limited plans. Use a good Cable Modem. Ortel usually provides CISCO DOCSIS 2.0. Which is okay, only if you getting good signal quality through your Cable. But Webstar Modem By Scientific Atlanta performs much better. You can also use DOCSIS 3.0 modem,; it will perform even better. Have less number of splitters or none at all, as the greater number of splitters, the more noise will be on the cable line. That results in less signal quality and lesser speeds. Check your cable line signal quality often.Go to 192.168.100.1 in your browser to check the modem device page.Check your Receive Power and Signal To Noise Ratio (SNR) in downstream and upstream. Believe me, they are important for you to get good speed. Receive power can range from -2 to 15 dBmV. The greater they are the better it is for you.As in Signal To Ratio +35 to +52 dBmV is acceptable.In Upstream anything above 29 dBmV is good.Note: You don’t need to be an expert to see these things, just make sure the values are good. If you are getting slow browsing speed, you can always lodge a complaint at the customer care support. At times, it’s slow because there’s just not enough bandwidth to cater everyone at the same time. Hope they increase the bandwidth resources for those areas where bandwidth requirement is higher. The best thing you can do is to ask your cable men to give you a direct connection with no splitters at all.Direct connection meant I have got a direct cable from the nearest node. It’s not always possible but you can ask the cable guys to use fewer splitters in your area. Splitters usually tend to degrade the signal quality. I have got a direct connection and advised others too, it would definitely help you in a great way. For example, All cables in your area are connected to the main node allotted to your area. From the node, the cables run to your home location and split many times for covering more area and homes in your area. Which then spits again with the help of splitters to more homes or in your home itself from which one goes to your TV connection and one goes to your Ortel Modem. You could ask your Cable guy to use fewer splitters or give you a direct “less polluted (with more users) line cable ” so that you could get a good signal to your modem. Well if they reject just say them that you will disconnect your connection if they don’t do that. 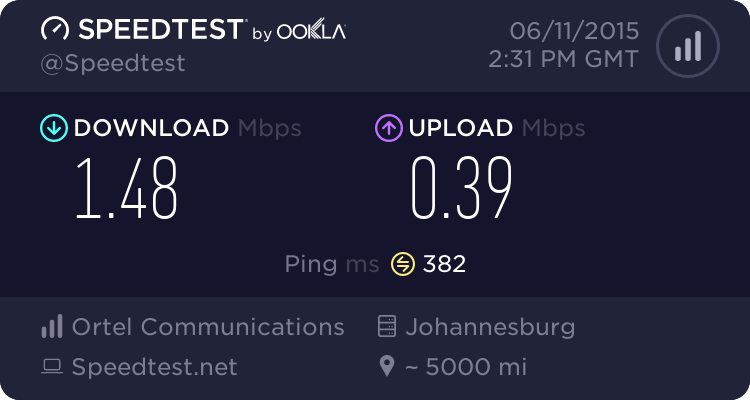 Remember you are paying for your connection and you at least deserve to get some basic speed from your promised speed. I also know that many have reported that the people or cable servicemen are very rude sometimes. But hope they co-operate with you. Note: I can’t guarantee that it will really solve your speed problems but for many, it can really help. Remember low signal results in low speeds. Did you know, recently Ortel announced 5-50Mbps speed up-gradation for its users in Bhubaneswar, Odisha? Well, they are lucky for now but 5Mbps from a cable broadband service provider is not much, though. We have seen great speed from other Cable ISP’s like Hathway, You Broadband, Manthan Broadband etc who provide really decent speeds like 20-100mbps at the same pricing as ortel, well many people do refer Ortel as a Local company, well that couldn’t be of any help, for now, right. I think they have the potential to reach the greater market and provide good services to current users, but the dedication is lacking behind for right now. Current things in which ortel lack are non-maintenance of their website from a long time, social media profiles, dedicated online support, online support complaint lodging and ticket system, better bill payment services, mobile or email alerts for bills like pending or clearance, better referral programs for customers ( believe me you would hardly get any benefit even if you refer someone). When someone has the potentiality they should be encouraged. Right now I’m a happy Ortel user and would really likely help other users who are facing problems with ortel. Thanks for reading this article. If you are facing any problems regarding Ortel you can always ask me. I still don’t know a lot of things, but I can provide necessary information related to this stuff that could help you up. Maybe I could advise you some ways so that you could enjoy Ortel Broadband and be saved from their pathetic service. In Sector -2 Service is Excellent ! But some Downtime(Dead) because of no main power supply ☺ Thats All ! Great Article! Hey Bro Many Chanel’s are blocked . BT I am pay For that Chanel. How can i sloved it. What Channels my friend ? You might need to contact the customer support. Well sadly for this you have to either call the customer support or you might have to visit the local office. If you have paid for the channel or subscribed to a package, maybe it isn’t activated yet. Do check this with them.